Last week, I got sent to the new County Fair here in Denver to take a portrait of one of its headliners, Charles Phoenix. The assignment sheet read “the rides are set up and Charles will be wearing a suit you can probably see from several miles away.” On paper, it sounded really promising, but when I got there, I had the hardest time with this assignment. Charles Phoenix calls himself America's Retro Geek. 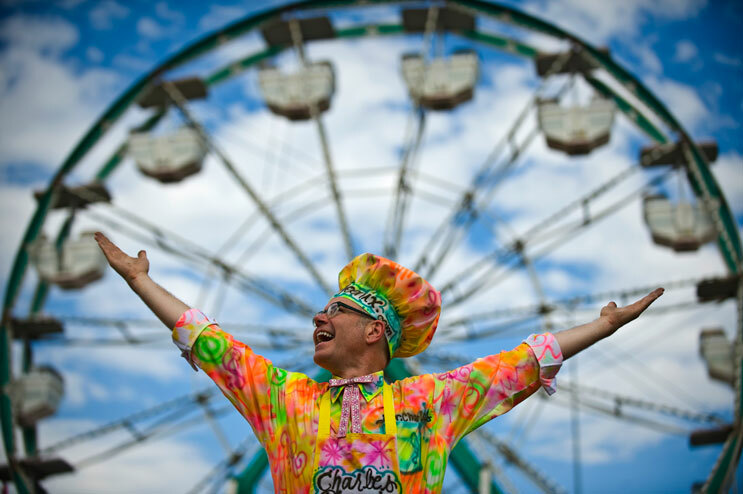 Dressed up in a suit airbrushed by a street artist, he sautés a mix of people's favorite breakfast cereals in butter in his test kitchen at the Denver County Fair. "I'm putting the kitsch back in kitchen," Phoenix said. Wednesday, July 27, 2011.